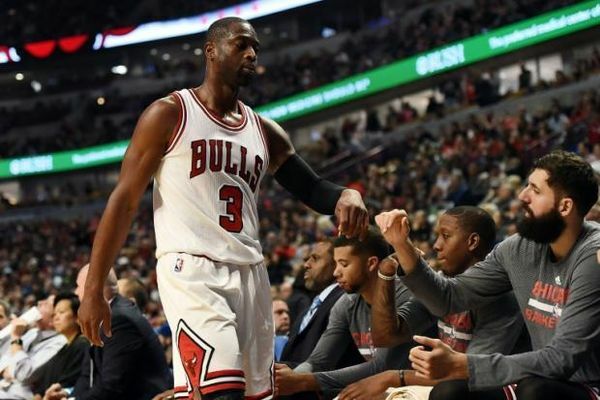 Dwyane Wade is ready to just enjoy being a member of the Chicago Bulls. That storyline has been lost, often without a trace, in Wade’s decision to leave behind the Miami Heat, the team with whom he spent the first 13 years of his career. But while money and, seemingly, a lack of communication and goodwill between Wade and Heat president Pat Riley played a part in driving him into Chicago’s arms, he does not want his time with the Bulls to be tainted by the idea that he settled. The sweltering aftermath of his Miami Heat career loomed with Wade’s fourth 3-pointer in the Bulls’ 105-99 win over Boston, and he toured the court with family and friends, fans and cameramen. “Homecoming,” he told them. An improbable scenario – his parents and family members at the Bulls’ season opener – turned into a forever night, sealing the memory bank. “I closed the Miami chapter right there,” Wade told The Vertical inside an empty locker room late Thursday. “I can’t focus over there anymore. I want those guys in Miami to be successful, but I’m motivated by greatness here. I’m motivated by doing what people think I can’t do, for sure. I had to make a decision, and I feel good about the decision I made. Indeed, the list of reasons why Wade now plays for Chicago is extensive. Chief among those determining factors is the fact that the Bulls gave him a two-year, $47 million deal, and the Heat didn’t. So while the beginning of Wade’s time in Chicago is marked by a deteriorating relationship between him and the Heat, the rest of his tenure now that he’s there is about enjoying an experience some part of him, however slight, always dreamt about.